Data monetization is the process of transforming the large unstructured volume of enterprise data into valuable insights for drawing economic value or exchange of service. Data monetization is the use of data assets for generating value to an organization. Monetization can be carried out in two ways: indirectly and directly. The large amount of data generated can be packaged into data products and sold (direct monetization) or processed to extract insights (indirect monetization) and can be used to support business decisions. The data monetization market has been expanding due to the increase in volume of data across a number of industries. Monetization of data has led to realization of the significant financial value, which is held by data in any organization. This has created a niche for data monetization in the global market. The market for data monetization is expected to expand to reach US$ 708.86 Bn by 2025 at a CAGR of 21.4% during the forecast period. Data monetization is helping organizations to reduce costs or increase revenue by investing in an analytics platform, which converts unstructured data into valuable insights from the real-time data streams. For example, a telecommunication company with large volume of information can either sell the data by converting it into valuable insights or charge a fee for the ability to access and analyze the data. The data monetization market is driven by the increase in data volume as well as enhanced capabilities to collect a wide range of data types. Large amount and variety of data is available with companies. Therefore, companies are more focused on utilizing this data in their business processes in order to enhance the processes and identify or estimate future trends. The global data monetization market is anticipated to expand significantly during the forecast period, due to the strong adoption of data monetization by mobile carriers and the BFSI sector. The mobile data traffic increased nearly 40 times from 2008 to 2015. The revenues associated with it tripled during the period. Additionally, many companies are inclined toward the use of data monetization in order to attain enhanced customer experience and expand market reach at a fast pace. Globally, telecom operators are facing competition due to the gradual loss of their core infrastructure revenues. The emergence of Over-The-Top (OTT) services has led to the gradual loss of top line revenues of communication service providers (CSP). Thus, the need for a strong infrastructure setup has grown significantly. However, concerns related to data privacy and ownership are relatively high. This is a major factor affecting the large-scale monetization of big data. The framework for the collection of personal data is fragmented based on national and regional laws & regulations that govern the extent of permissible processing/analysis and transfer to third parties with and without consent. Rapid advancement in big data and analytics solutions is a key trend boosting market growth. Monetizing utility data is likely to be the next logical step in the evolution of data generated from automation technology in sources such as connected home and smart utility meters. Through the use of smart meter data, utility companies have high possibility of improving operational cost structure, customer experience, and overall performance. For instance, Google’s smart thermostat product, Nest, monetizes the collected data by providing it to utility providers. The data monetization market has been segmented based on component, method, industry vertical, and application. Based on component, the market can be segmented into platform, software (standalone, suite), and services (professional services and data as a service). In terms of method, the market has been bifurcated into direct monetization and indirect monetization. In terms of industry vertical, the market has been classified into telecom, e-commerce & retail, BFSI (consumer finance/banking, business banking, capital markets, and insurance) healthcare, travel & logistics, and others. Based on application, the marked has been split into sales & marketing, supply chain management, capital asset management, remote equipment monitoring, and others. From a geographical standpoint, North America is expected to hold major share of the data monetization market. Growth in this region is attributed to the strong adoption and penetration of the data monetization platform, software, and services as well as presence of large number of data providers. Asia Pacific is anticipated to witness lucrative growth due to the rise in adoption of digital services such as over-the-top services, Internet of Things (IoT), cloud, mobility, and artificial intelligence. Furthermore, the data monetization market in Middle East & Africa (MEA) and South America is also estimated to expand significantly during the forecast period. Rise in awareness about data monetization and increase in adoption of data monetization across Asia Pacific and Middle East & Africa are offering new opportunities for key players operating in the global data monetization market. Tapping into digital data is expected to offer significant opportunities for companies to understand the demand trends to enhance their business, thereby simultaneously providing a new revenue stream by monetizing the data. Attracted by this fast expanding market, underlying technological advancements, and rising trend for data as a service, many players are developing comprehensive suite of software and services for a number of industries. Various companies across industries are striving to strengthen their foothold in the data monetization market. For instance, in 2017, SAP SE partnered with Vodafone to launch the Internet of Things (IoT) foundation bundle for SAP HANA, with device connectivity management capability from Vodafone. Through this partnership, the company would be able to collect and shift data from the devices into the SAP HANA platform for various uses such as predictive maintenance. However, existing software providers are rapidly increasing their distribution network in order to reach most distant customers. 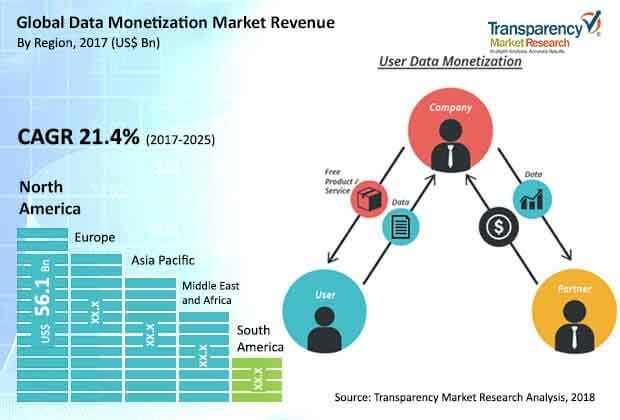 Key players profiled in the data monetization market report include Adastra Group, CellOS Software Ltd, Connectiva Analytics and Insights Ltd., Dawex Systems, Infosys Limited, Mahindra ComViva, Mnubo, Netscout Systems, Inc., Paxata, Inc., Optiva Inc., (Redknee Solutions Inc.), ALC, SAP SE, SQLstream, Inc. and Virtusa Corporation.